Born May 30, 1941 in Duisburg, Germany. Died December 1, 2011 in Bern, Switzerland. Two sets of facts, two pseudo-sentences: delineated by periods but sharing a single implied subject. And between them, a little gap. No more than the standard space between two words. Perhaps the breadth of a breath. And, somehow–absurdly–what is held (or what is meant to be held) in that tiny space is the implication of the whole of a life, complexly lived. I listen to the whirring ceiling fan above me, the chirping crickets outside my window, the brief clamour of a passing plane, and then the tinny thrum-beat of my mechanical heart valve echoing in my chest, suddenly made loud by the dissipation of the engine noise, and amid all of this I also find some part of that life (complexly lived) held here. In a stillness that bristles along the edges of my skin and sets my arm hairs on alert. In a liveliness that animates my spine and rib cage and pulls my organs ever so slightly upward and inward. In the mask of my face, vibrating along a contour that traces the wetness between my teeth and tongue, spreads outward along my sinuses and nasal passages, and gathers into a peculiar curlicue that manifests in the steadfastness of my gaze. It is a precise inhabitation of the dynamic corporeal architecture of my body, an enactment and an alignment that not only signals but also somehow contains–only through and always beyond its timespace materiality–a connection with my friend, Norbert. That holding, which cannot be described, of which these words provide only a butchered glimmer, is what Norbert continually reveals to me of himself. What he continually teaches me about myself. In life, Norbert set himself the task of attunement. His art was a double-edged practice of using what is there and of making what one does all that is there. These two actions, contradictory and yet somehow alike, might both involve no more than simply acknowledging and attending to what discloses itself as being there: as time, as space, as matter, as texture. At the same time, neither action could be anything less than a simultaneous act of creation and destruction. At a certain point, it becomes meaningless to even try to distinguish the hollowing out from the filling up. What can be said? I smell his dried blood on a piece of gauze–one constellation of items in a box of performance residue that Norbert constructed and then sold as part of The Art of Making Art, a performance he did at the 2008 7a*11d festival–and it smells like all human blood. But my body remembers, and so it doesn’t just smell like any human blood. It smells like Norbert to me. 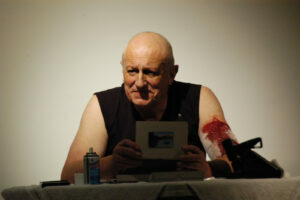 Based in Switzerland, Norbert Klassen began working in experimental theatre in the 1970s, working as a stage director and actor as well as studying dance therapy and speech training. 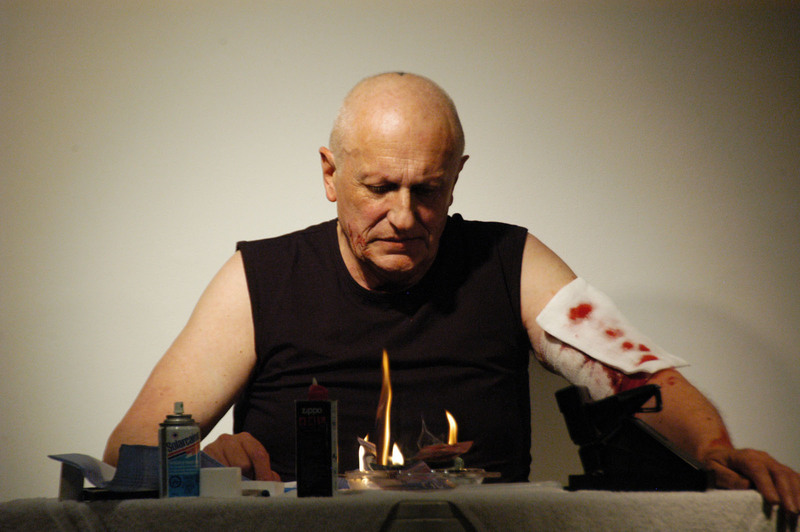 Although he maintained links to the theatre world throughout his career–teaching for many years at the Drama School in Bern and working regularly as a director at the Theater an der Effingerstrasse–Klassen came to identify himself primarily as a performance artist after his “experiments” were considered unrecognizable as theatre by his colleagues, but were embraced by the performance art community. Klassen began creating solo “performances” in 1979, and in 1980 became a founding member of the performance art group Black Market International. From 1990 Klassen concentrated primarily on intermedia projects, including exhibitions in Germany and Finland. He contributed substantially to the international performance art network through his participation in numerous events around the world, solo and as part of Black Market. As well, he maintained a thematic performance art festival in Bern called Bone. Norbert Klassen participated in the 6th 7a*11d International Festival of Performance Art (2008) as a creative resident, gracing us with two extraordinary performances and an hilariously beautiful intervention on the final day.